Lauren says, "My recycled elements this week are both pretty pieces of giftwrap saved from holiday packages last xmas: the kraft and red paper with the pine boughs, plus the adorable midcentury-modern-style animals that were obviously way too cute to toss away. 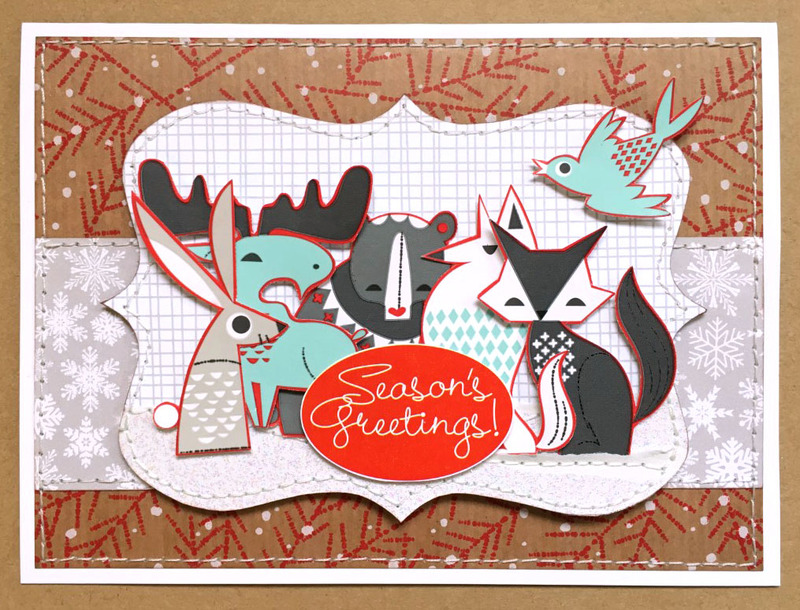 I've used the brand new sketch from Sketch Saturday to make my card extra fresh, however!" Stephanie says, "I won't lie ... when I saw this adorable Yeti on the packaging for the Glad Storage Containers I buy each holiday season, I let out a little *woot* right there in the grocery aisle. I knew that cutie was going on my Earth Day card. Turns out it took me over an hour to remember where I hid the little cutie, but I finally found him and put my card together. I had to do some creative trimming to get rid of the words, but I like how it sort of looked like an ornament when I was done." 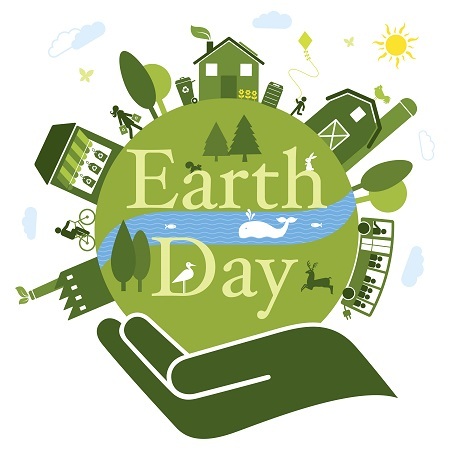 It's one of our favorite prompts of the year at Jingle Belles ... when we celebrate EARTH Day (Sunday April 22nd officially) by creating cards using recycled elements. 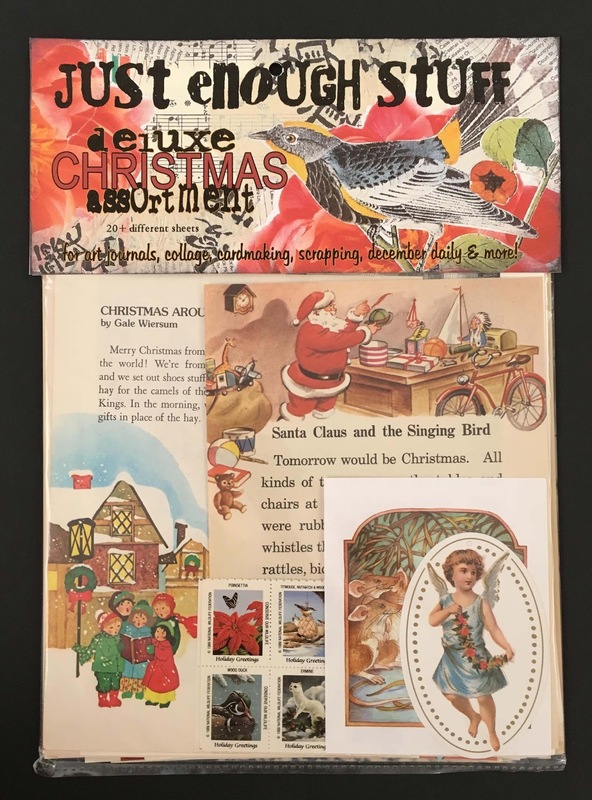 Maybe you saved your holiday cards from last year planning to up-cycle the images ... or you've saved packaging that you thought would be cool to use ... you know we've all got a stash like that. Well now is the time to break out your saved stuff and use it. Here's what we created with our recycled elements. 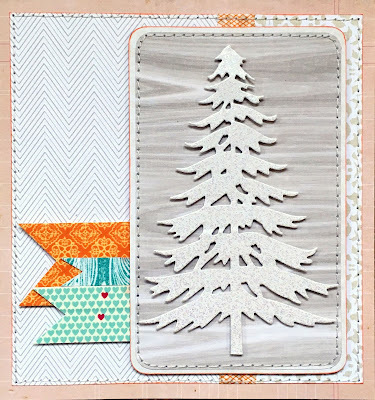 Stephanie says, "I've saved that cool grid paper (which was the packaging for some Studio Calico journaling cards) in my stash for quite a few years ... and I think it makes a super-cool background for this modern holiday design. The inspiration and sketch are from Fusion Card Challenges and all the cardstock were scraps I had on my studio table (so that was recycling too). I did my favorite gem flourish surgery to decorate my tree with clear bling and finished with a coordinating sticker sentiment." Lauren says, "The center panel of this card is an amazingly pretty cardfront from one of the holiday greetings I was sent this year. I confess that using it felt a bit like cheating, but you know... in a GOOD way, lol! Because let's face it, that thing was already so pretty, it didn't need much, did it? 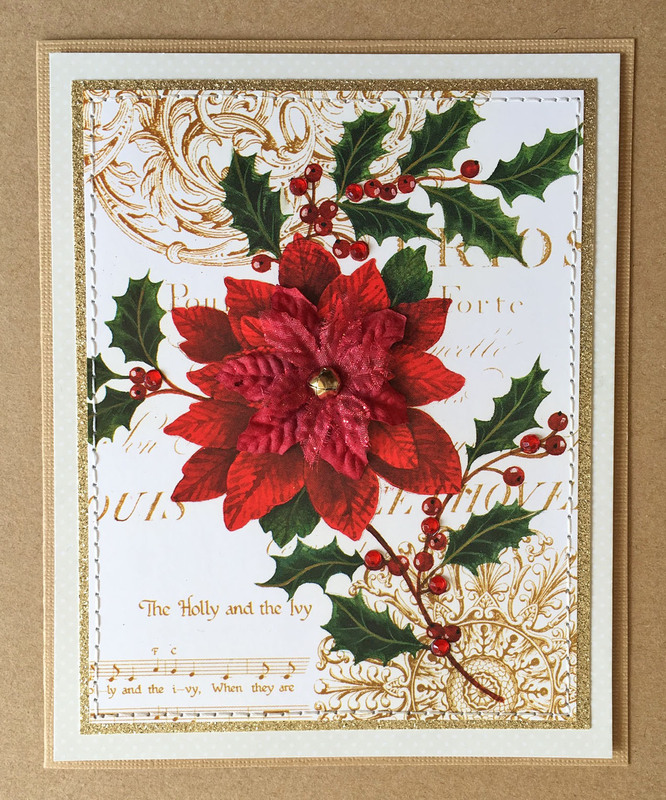 It was flat, though, so I added texture in the form of fabric poinsettias in the middle of the printed one (attached with a jingle bell brad); I adorned some of the printed holly berries with sparkly red Eyelet Outlet gems. 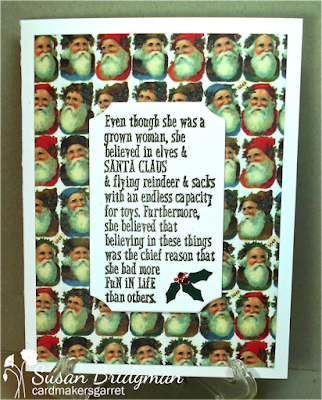 Then I matted the trimmed-down panel onto a piece of gold glitter paper, and then onto a mat cut from a piece of pretty, slightly glossy, cream-colored Making Memories packaging. Et voila!" Now it's your turn to pull out your own box of things "too pretty to throw away"; OR raid your recycling bin or waste paper basket for fun bits of packaging and paper! Be as creative as you like, and HAVE FUN! Link up here by 6pm (EST) on Wednesday, May 2nd. Keyword for galleries or Flickr is JB:18:09. We loved seeing all of the creative ways you interpreted our inspiration photo. Here are a few that were optimal. you know we're suckers for punny sentiments ... and little puppy tracks in the snow ... and perfect use of the colors to decorate both the tiny village and cute little doggie ... and did you see those fabulous clouds? 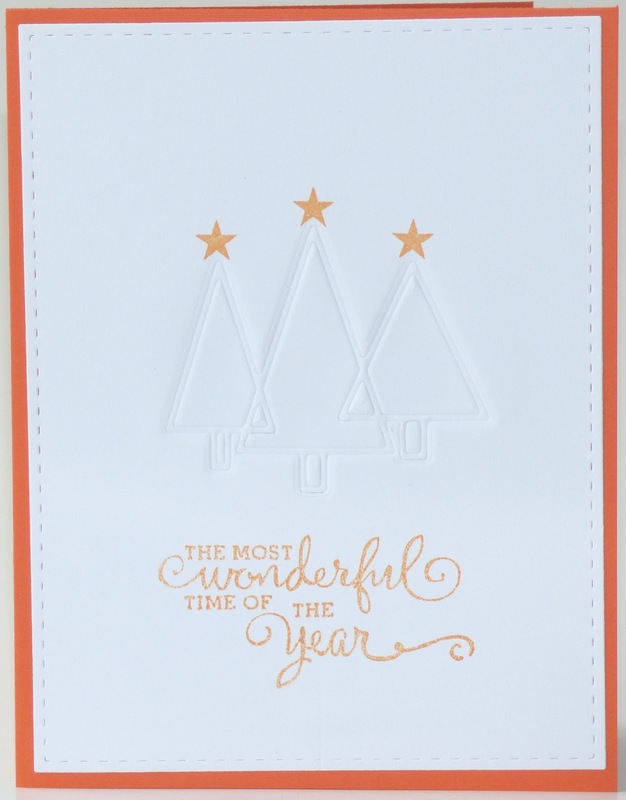 really rocked the white space with the perfect amount of texture from embossing and stitching ... and the orange ties it all together. 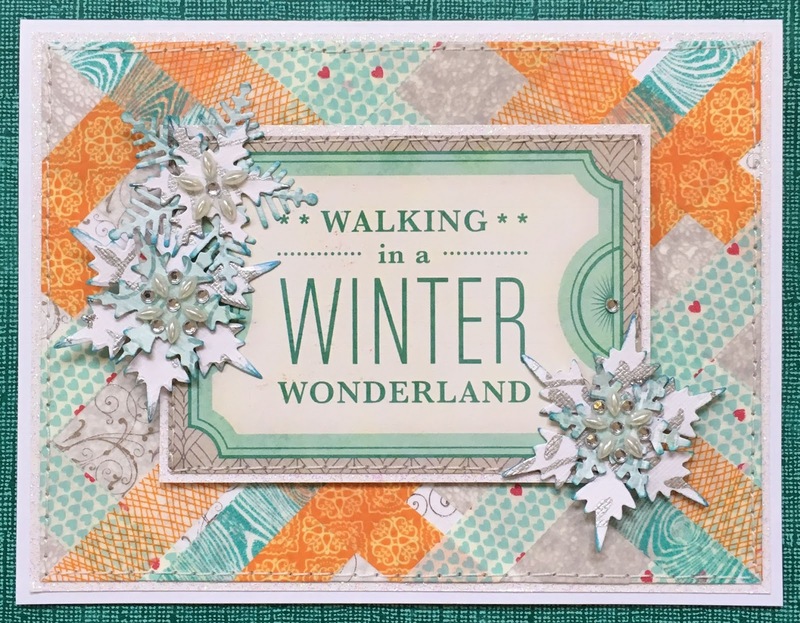 created with snowflakes from all three colors with the wonderful pop of color from orange stripes and an orange sentiment ... wonderful combination of elements. See you back at Midnight for our annual ode to the Earth. Did you get fruit in your stocking when you were a kid? We always got a bit navel orange and an apple (and a glass bottle of Coca Cola, which pretty much filled the stocking). Today we're still creating cards inspired by this lovely holiday scene. Lauren says, "I mentioned last week, for anyone who's not a fan of the bright orange-- or perhaps just doesn't have much in the way of orange supplies-- there are a couple of ways to go: you can ignore the colors completely, and focus on selected elements like the tree, the fireplace, the presents, etc; OR you can just tone them waaaaaaaaaaay down. My card this week is probably closer, proportionally, to how much bright color is in that room compared with how much white + neutral there is. 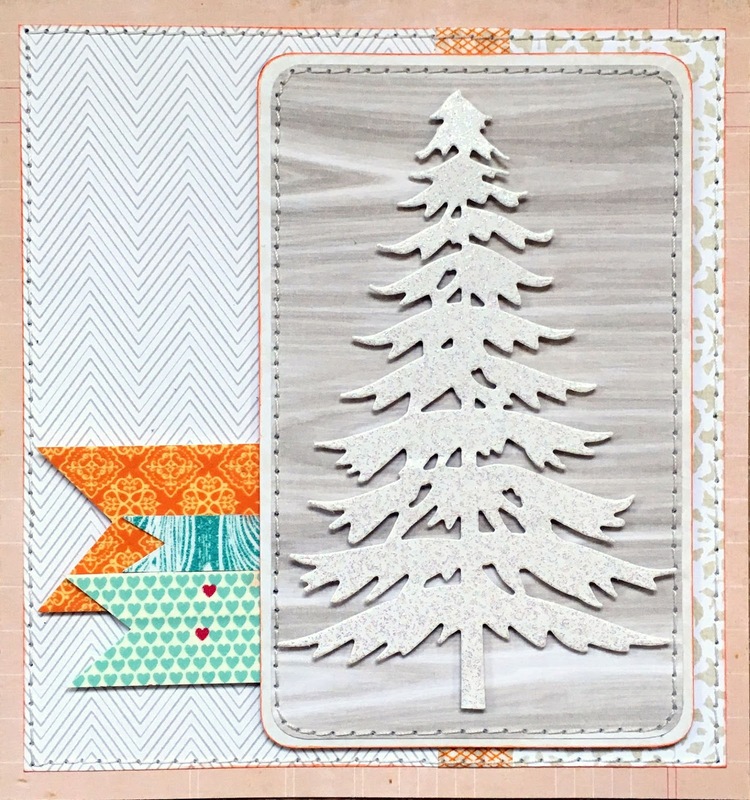 Once again, there are no "holiday" supplies, except for that awesome Memory Box die, "Marvelous Pine". 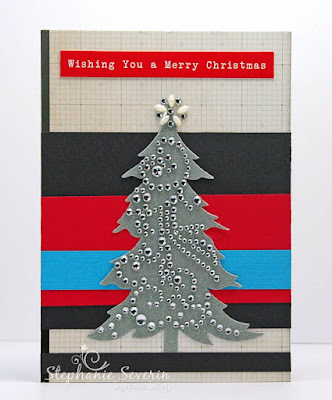 I've got a bunch of different whites-- including a white-ish woodgrain and some white glitter paper for a bit of sparkle. My pops of vivid color come from washi tape, and I've put the entire panel onto a much softer orange background." 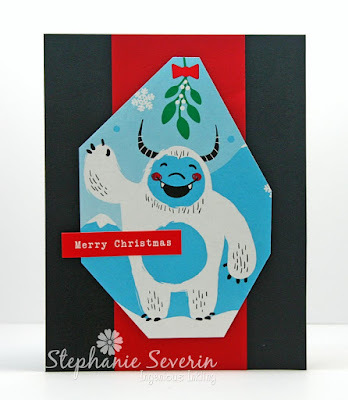 Stephanie says, "I did a riff on Lauren's Washi Tape card for last week's post. 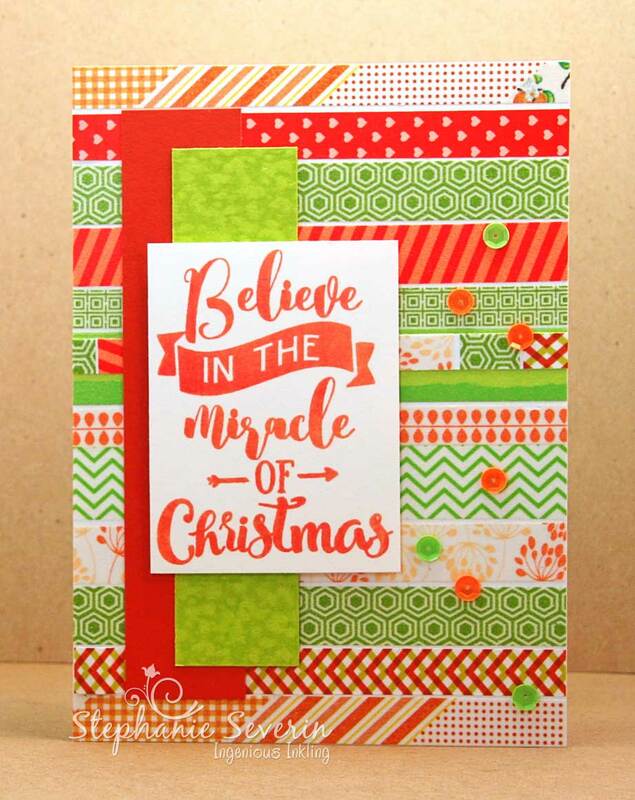 I loved combining all of my orange and green patterns for a fun striped background. 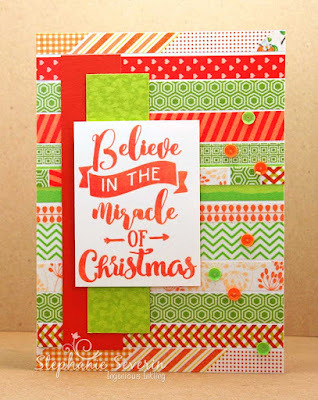 For the big bold white element, I stamped a sentiment from STAMPlorations Miracle of Christmas and finished with a sprinkling of sequins." Scroll down to the original post to see the readers' gallery, check out the complete challenge details, and link up your own masterpiece! This week we're bringing you an Inspiration Photo to inspire your designs. 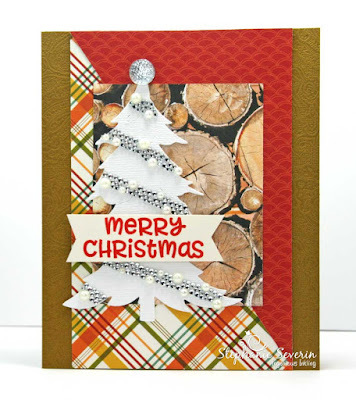 Stephanie says, "I was drawn to the plaid wrapping paper on the presents under the tree, so that is where I began my design. While my greens, oranges & yellows are a bit more muted than the hues in the photograph, I still captured the feel. 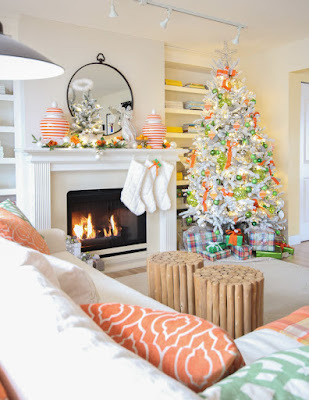 I added in coordinating patterned orange paper inspired by the pillows and designer paper of wood logs inspired by the coffee tables. 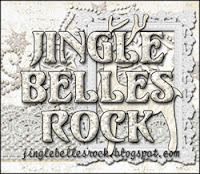 I finished with my very own white tree decorated with clear lights & pearl ornaments (aka Eyelet Outlet Fancy Long Bling) and a sentiment from Reverse Confetti Sentimental Christmas. 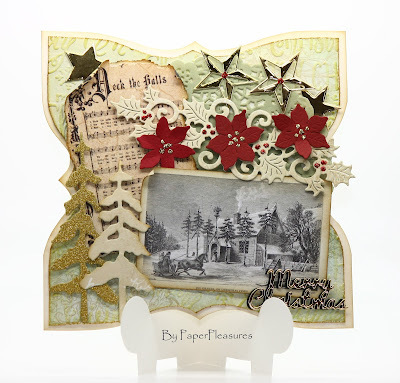 The layout is the final Sketch For You to Try from Reverse Confetti as my layout." Lauren says, "I confess that my first thought when I saw the photo was that I didn't have ANYTHING in my xmas stash with those colors. But then I realized I have loads of non-holiday washi tape in pretty much every shade shown; and loads of fab xmas stuff in white! I decided to make a background with the colors and let my centerpiece be a cluster of white and silver snowflakes. Then I found the cool Crate Paper journal card with nearly the exact same teal as the accent pillow in the foreground-- score! 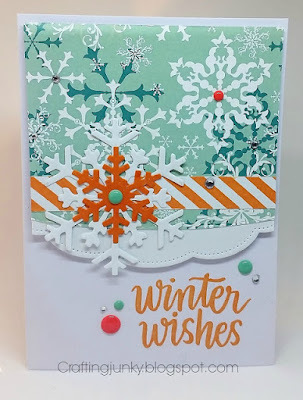 So I scaled back my snowflakes to a slightly smaller size to fit around the journal card, et voila! I also made a second card that mixes a white diecut Christmas tree with the same washi background... 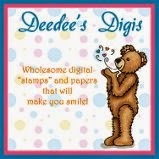 I'd love for you to click over and see it!" Remember, you can use as many-- or as few-- elements from the photo as you'd like! Be creative, think outside the box, and have FUN! Link up here by 6pm (EST) on Wednesday, April 18, 2018. Keyword for galleries and Flickr is JB:18:08. 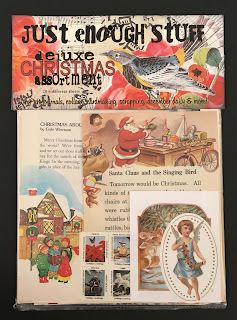 ...combined many gorgeous bits and bobs in a beautiful "collagey" style, made even better by the uniquely shaped card base! 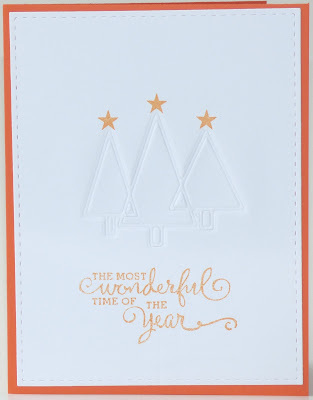 ...stamped what might be the Best Sentiment Ever, then let it shine by making it the star of this lovely card! ...posted three of seven (!) 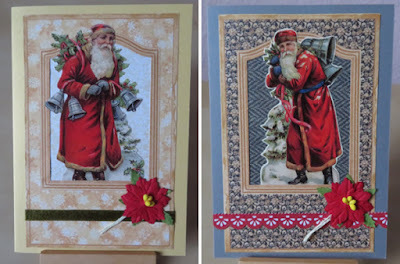 cards she made featuring gorgeous vintage Santa illustrations teamed with just the right embellishments!